Trusted Reviews - "Dishonored 2 takes it a step further and delivers one of the most rewarding experiences I've had in Gaming." PCGamer - "If you ever thought ‘they don’t make them like they used to’ during the triple-A funk of the mid-noughties, then Dishonored was a reassuring return to form. 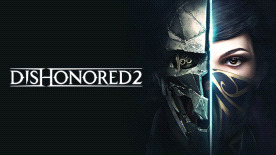 Dishonored getting a proper sequel takes that further. It suggests that you can stop thinking about how they used to make them, and start getting excited about how they make them now." BitGamer - "Regardless, there's an unmistakable feeling of quality to certain games, and Dishonored 2 has it." We've been praying for a follow up to Dishonored ever since we first set foot in Dunwall, and the announcement of Dishonored 2 earlier this year has us all kinds of excited. E3 raised a whole bunch of questions and tantalising possibilities. The fact that Emily Kaldwin is playable has us very intrigued, and from the looks of things, she's picked up some seriously cool powers from the Outsider too! Dishonored 2 is set 15 years after the events of the first game, with a usurper having seized the throne from Emily, and the player charged with restoring her to power by playing either as Emily herself or returning masked hero, Corvo Attano. The game will take players beyond Dunwall to Karnaca – a coastal city where the fate of the Empire will decided. Dishonored 2 looks bold, brutal, and beautiful, and it looks like Arkane are brimming with brilliant ideas for this sequel.